How do I let my customers Upload a File? Your products may have multiple options. For instance, if you sell clothes in your online store, a sweater may come in small, medium, and large. On the other hand, you may also have product options that require input from the customer in order to customize the product. For example, you sell T-shirts and you need to give customers the ability to upload a picture so it can be printed on the shirt. This article will show you how to setup options that allow customers to upload a file. Type in the Option label's name. For example, "Logo Upload"
Type in the Sorting number – this is used to control how your options display if you have more than one for the same product. Lower numbers will display before higher numbers. 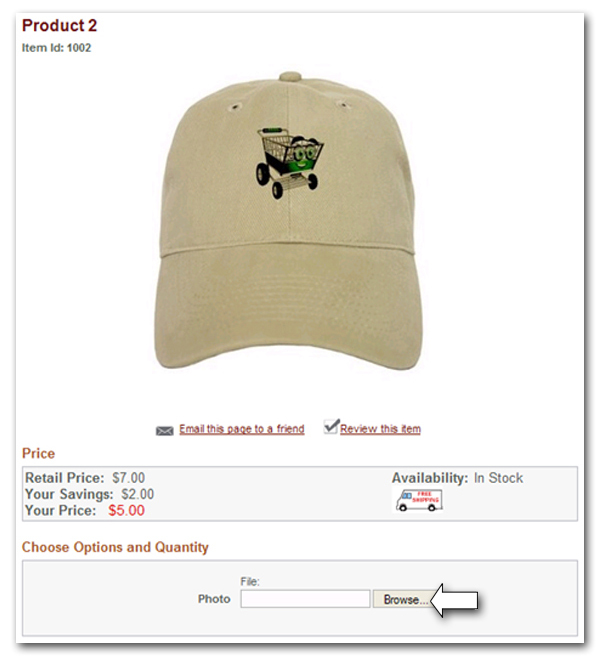 Using the "Type" drop down menu, select the one labeled "File"
Check the Required checkbox if you would like this option to be selected in order for the product to be added to the shopping cart. Once you've added the Option Label, you will see it listed in the Options Tab. Now, we'll go over the steps involved in setting up the individual option sets - in other words, the actual selections - for that option. Look to the far right of the option listing and you will see three links to add option sets, delete the option altogether or edit it further. [option name] will reflect whatever you named the option label. Enter a description for the individual Option such as "Upload your logo"
If the option incurs any additional cost, enter that amount in the "Value" field. The customer will click the browse button to search for their file, then upload it. A link to the file will then appear in the order in your Store Manager. The file can then be retrieved and used for whatever purpose it is intended on the order. It is important to understand how certain file types are treated for the File Upload product options, and how they will be retrieved when you're processing the order. The following file types will be presented on the order as a simple link that will let you retrieve the file outright. All other file types will be automatically compressed into a zip file. When processing the order, you will click on the download link to retrieve the zipped file and you will need to use an unzipping utility program (i.e. WinRar, WinZip, 7-Zip, PeaZip, etc) to retrieve the actual file from the zipped archive file.